Amlwch is a small village on the North East tip of the Island of Anglesey off the North Wales coast. 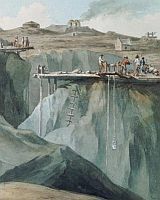 In the 18th & 19th century the copper mines on parys mountain were the largest in the world, with copper being exported to many countries from the small harbour at Amlwch port. The need to export the ore resulted in the development of the port from a small fishing harbour to a location for the repair and eventual building of new ships. This in turn resulted in the growth of smaller industries in the area and the migration of people to and from the area. Even thought the mine and ship building industry is past it’s peak the legacy maritime and chemical industry continues to survive in the area. Some of the industrial and social history of the area can be seen from this web site. For more information please select from the menu.